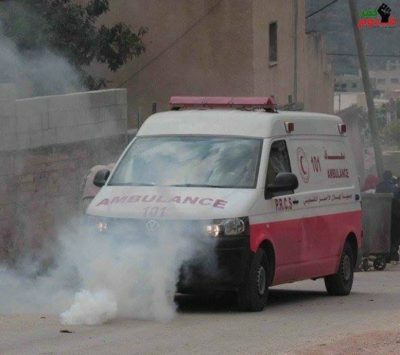 Israeli soldiers attacked, Friday, the weekly protest in Kufur Qaddoum town, in the northern West Bank district of Qalqilia, and shot three children with rubber-coated steel bullets, in addition to causing many protesters to suffer the effects of teargas inhalation. Morad Eshteiwy, the media coordinator of the Popular Committee in Kufur Qaddoum said many army jeeps, and bulldozers, invaded the town, fired rubber-coated steel bullets, mildly wounding three children. He added that the soldiers also fired a barrage of gas bombs, some targeting local ambulances, causing dozens of Palestinians to suffer the effects of teargas inhalation. Eshteiwy also stated that this week’s protest comes in solidarity with the Palestinian detainees, who plan to start an open-ended hunger strike on April 17, which marks the Palestinian Prisoners’ Day. Kufur Qaddoum residents, accompanied by Israeli and international activists, hold weekly protests against the illegal Israeli Annexation Wall and colonies, in addition to demanding the army to reopen the town’s main road, which was completely sealed 14 years ago to enable easy access to the settlers, living in Kedumim colony, built on private Palestinian lands.